work this allows the operator to position the cylinder from left to right with the touch of a lever. Choose from our 50, 100, 150, or 250 H-Frame Press with the regular 12 or 20 Ton Broach Press. We can customize any of the hydraulic presses we manufacture, so if you need a specialized Broach Press and H Frame; call us, we can build it! Buying an H Frame press and buying a secondary broaching machine or broach press comes with a high price tag. 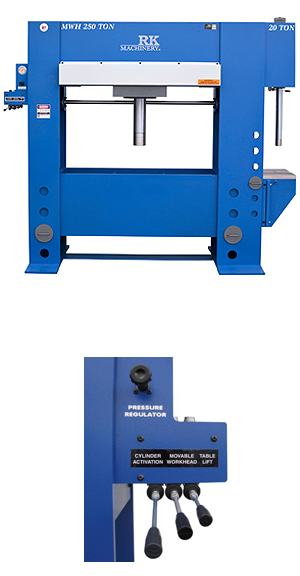 RK Machinery has conveniently combined these two hydraulic press machines in one unit. Not only does this take up less floor space in your shop, it also comes at a lesser cost than buying the two machines individually. Our hydraulic Broach Press and H Frame machines are easy to operate and allow a wide range of machining tasks to be performed. Perfect for both the inexperienced worker and the most skilled machinists. Our shop presses run on low oil pressures and temperatures making them safer to operate, easier to adjust and more accurate. Make your machine shop run smoothly using our efficient and accurate hydraulic presses. All of our hydraulic and mechanical parts are standard in the industry and available throughout North America. And every hydraulic press we manufacture, including our Broach Press and H Frame, is made right here in North America. That means if you have a problem or a question, we’re easy to get a hold of. We also make a point of using easy to find parts and materials that are in-stock at your local hydraulic repair shop. So in the event that you need a replacement part, you can rest assured it will be easy and quick to find. That means you won’t lose money having you production line shut down for costly and time consuming repairs...Keep your shop up and running with a reliable hydraulic press. Having a machine shop organized and set-up for efficiency directly impacts your profits—in a good way. Cutting down on the amount of time workers move between workstations, the time spent adjusting or setting up hydraulic presses and other machinery, time spent repairing and other factors must be considered when streamlining your production line. Finding and eliminating safety issues, production bottlenecks and time-wasting practices is important to become more efficient and profitable. Our combination Broach Press with H Frame allows you to complete a wide variety of machining tasks at one efficient workstation.